Now that the kids are out of school and you don’t have to worry about scheduling around homework, after-school activities and bedtimes, it’s time to plan some summer date night ideas! Summer is probably the most romantic season. I mean, look how many movies there are dedicated to summer romances, how many romance novels feature couples walking on beaches. It’s just designed for love! Even though you and your partner aren’t at that “summer fling” stage anymore, there’s no reason you can’t recapture that feeling together! Check out these summer date night ideas for couples and start acting like a teenager again! You don’t need to spend a ton of money on summer date night ideas! These 5 ideas are relatively inexpensive. Some will only cost you the price of your babysitter? Don’t have one? Check out our date night ideas for couples without a babysitter. Fireworks Date Night. Most of us take our kids to the fireworks on the 4th of July, but that isn’t the only night to see them. Check your local newspaper for other dates. In my area, one resort does theirs on the 4th, but another does it on whatever Saturday is closest to that day (the 5th this year). Another does it a week later! Then there are fairs and other events that include fireworks all throughout the summer. All you need for this summer date night idea is a blanket and your partner! Events in your local park. Whether you live in a large city with huge free concerts or a small town that hosts a simple block party, chances are something is going on in your area throughout the city. From art walks to freedom festivals, these are great opportunities to get out of the house for a fun summer date night. You may even discover a new favorite band or artist! Shopping Date. Wait! Don’t skip this! I know, you’re thinking “how can shopping be a date?” I’m not talking food shopping or shoe shopping here (unless that floats your mutual boats). Spend the day together browsing antique stores, flea markets and farmer’s markets. My brother and his wife LOVE shopping for fresh produce and creating recipes together later. My friend and her husband enjoy visiting the flea market searching for fun fixer up projects and cute summer décor. The point is to spend time together shopping- or even browsing- for things that you can take home and work on as a couple. Summer Date night on vacation. Planning a family vacation this summer? Many hotels and resorts offer babysitting services for a small fee. Some even include it in your costs! Check out the services offered and take advantage of them to explore a new area with your partner. If you’re concerned about leaving your precious little one behind, take the time to relax together in the hotel’s pool or hot tub. That way you’re close by in case something comes up. Romantic Scavenger Hunt Down Memory Lane. First, you and your partner decide who will be the “hunter” and who will give the clues. The person giving the clues sits down and comes up with vague (yet not too complex) hints to describe places you’ve been together. For example, if your first date was to see, say, Godzilla (first thing that popped into my head, my son’s Godzilla cup from a party is sitting in front of me), you might put “we awkwardly held hands in the dark while a giant lizard ravaged Tokyo.” At each stop, take a moment to reenact to talk about your favorite memories from that place, then give your partner the next clue. These are just a few fun summer date night ideas for couples. I left off the more obvious, like walks on the beach, hiking or picnics under the stars. Those are just as fun too, of course! The whole idea of a date night is to do something you both enjoy together. As long as you’re making time for each other, it’ll be a success. 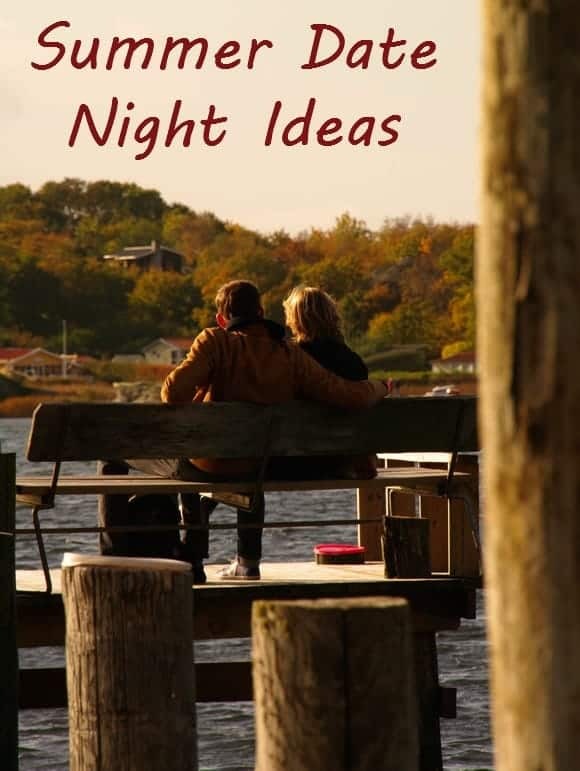 What is your favorite summer date night idea for couples? Great ideas! My husband and I love making day trips of hitting every thrift store we can find! We have a blast! My favourite idea is summer concerts and also picnics! What cute ideas. I especially like the scavenger hunt down memory lane. What great ideas for a fun night out! I will need a great night out after the baby is born! Great ideas for a fun night out without spending a lot of money. I need to go on a date with my husband! These are some great ideas. We live in a pretty rural area, so I was happy to NOT see “go to a museum, etc., etc.” in your post. These are cheap, easy things even WE can find time for. Thanks for the reminder!